—; Lennon, Donna Pedro (2018). Lucas, Gerald R., ed. Norman Mailer: Works and Days (Revised, Expanded ed.). Atlanta, GA: The Norman Mailer Society. ISBN 978-1-7326519-0-6. Comprehensive, annotated primary and secondary bibliography with life chronology. — (2003). "The Naked and the Dead". In Parini, Jay. American Writers: Classics. Gale. pp. 246–50. ISBN 978-0684312682. Rhodes, Chip (2010). "Hollywood Fictions". In McNamara, Kevin R. Cambridge Companion to the Literature of Los Angeles. Cambridge UP. pp. 135–144. ISBN 978-1-234-56789-7. 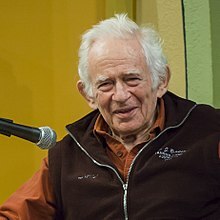 Wikimedia Commons has media related to Norman Mailer. This page was last edited on 18 April 2019, at 22:11 (UTC).